As man’s best friend, dogs get special attention almost everywhere. That’s when they’re being nice. But even the friendliest of dogs can have a bad day. This is when they howl, cry, or do crazy things. Sometimes dogs dig in the ground for some reason—you should exclude the possibility of cats burrowed in the ground here. Many reasons cause dogs to dig in the ground. Since you are not a dog psychologist, the normal reaction is to think that your dog‘s simply having fun. After all you see it happening almost every day. Even bred dogs do that. Terriers are known to dig in the ground in search of prey. 1. To probe. Dogs are naturally curious animals. They smell anything that passes in front of them. When they smell something funny, they’ll waste no time in digging up for it. 2. To get rid of boredom. For most of the night your dog is on patrol, so it ends up sleeping long all day. If it wakes up, it is full of unspent energy that it just burrows its nose in the ground and starts to scratch away. 3. Bury something. Dogs love to play with things such as shoes, bags, slippers, and dry bones. Sometimes they take these things out and bury them in the ground, just for play. 4. For cover. Dogs dig holes to take shelter in on warm days. When your dog grows very old it can’t regulate its body temperature just as well as when it was young, so it needs to burrow in the ground to cool down. At rare times, dogs dig to make holes for their pup as in the case of pregnant dogs. Dogs dig to catch mouse or other rodents that have holes in the ground. Stray dogs dig in the ground to run for cover, if not attract attention from prospect masters. But most times your dog digs a hole simply to kill time. 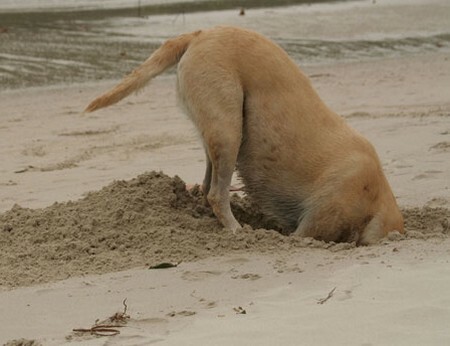 You need to know why your dog is digging a hole in the first place. If you have a dog of breed, give it something to play with to ward off its attention from the ground. If you have spare time for an early morning or late night walk to the convenient store, take your dog with you. 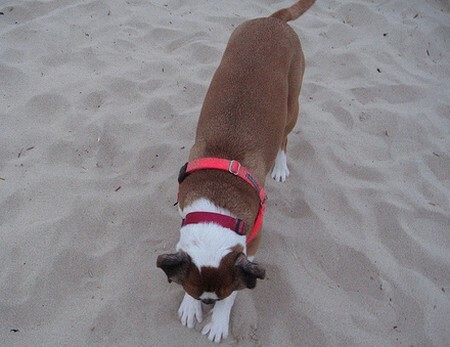 Weekend is the perfect time to take your dog out to the beach or somewhere it can run around and do its thing. Nothing pampers your dog more than the time you spend with it, so it completely forgets about digging. If you catch your dog in the act, discourage it from digging by covering the hole with stones or cardboard. Make it feel that you don’t like what it’s doing. It may take some time before it settles in your dog’s mind, but it surely will, with a bit of your patience. Dogs behave like their masters. You win more friends with a well-trained dog.